Learn about Megan Coyle and her Bosty photo series. Identify different places and settings from photographs. Read stories about Bosty that were posted on Coyle’s blog. Make a Bosty photo collage by using photographs. Note: Before beginning this lesson plan, make sure you tell students to bring photographs from home for the art project. 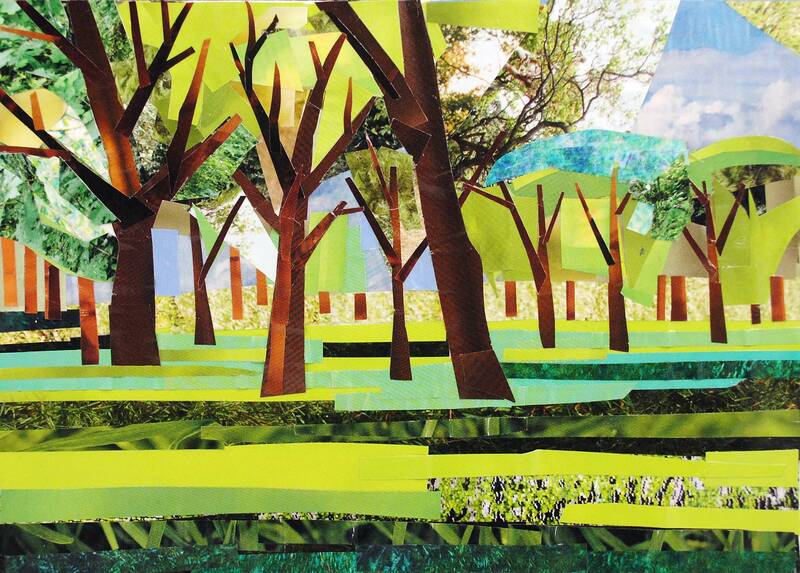 Tell students they will learn more collage artist Megan Coyle and study her Bosty photo collage series. Review the background on the Bosty project. Discuss with the class: How were these works of art put together? What kind of animal is Bosty? How can placing Bosty in different settings help tell a story? Review the Travels with Bosty activity. Can the class identify the different objects in the pictures? Can they tell where Bosty is? See if students can guess where he is before sharing the correct answer. Read a few of the stories from “The Adventures of Bosty” blog posts. Discuss with the class: If they were on a trip with Bosty, where would they go? What would Bosty do? Print out the Make a Bosty Series worksheet and pass out the scissors and glue sticks. Review the instructions with the class and have them cut out the image of Bosty from the worksheet. Tell them to imagine that they are taking a picture and Bosty decided to jump in front of the camera to get in the way. What would the photograph look like? Have them glue down the Bosty cut-outs on their photographs. Have students share their Bosty pictures with the class. Can they guess where Bosty is for each photograph? What do the students think he is doing on each trip? Have students begin the online lesson activities: Background on the Bosty Series, Travels with Bosty, “The Adventures of Bosty” Blog, and read the artist biography. Have the class review the Bosty series. Can they tell how the Bosty pictures were put together? How does changing Bosty’s setting help tell a story? When reviewing the blog posts, ask: What does changing the placement of Bosty on the photograph tell us? What did you like about the stories? Which one was your favorite? Review Megan Coyle’s collage technique. Discuss how Coyle took an image of a completed collage and superimposed it on photographs to create her Bosty travels stories. Print out the Make a Bosty Series worksheet. Review the instructions and pass out materials for making Bosty photo collages. Could the student identify cities and places from photographs? Did they point out specific examples during the class discussion? Did the student complete a Bosty photo collage? Did he or she find creative ways to incorporate the Bosty cut-out with the photographs?